Giveaway ends July 19, 2012. 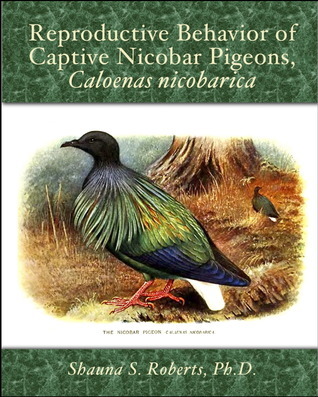 Reproductive Behavior of Captive Nicobar Pigeons, Caloenas nicobarica has been released as a trade paperback book. It is available from Amazon.com. Click here to go to that page. Also, Goodreads is running a contest for the next couple of weeks. If you would like to enter to win a free copy of this book, click on the link in the graphic above. This book is a scan of a 1984 dissertation on mating behavior among an unusual species of pigeon that breeds in colonies. The author researched mate choice, nest building, and other mating behaviors in a captive colony of Nicobar pigeons (Caloenas nicobarica) at the Lincoln Park Zoological Gardens in Chicago from 1980 to 1982. Her research data are supplemented by information from preceding and subsequent years. In addition, this dissertation contains a literature review of previous work on the Nicobar pigeon, an ethogram consisting of a list of Nicobar pigeon behaviors and their description, and breeding histories for all individuals who had ever reproduced. The 2012 printing by Nicobar Press contains a brief update of relevant literature published after 1983.